Marriage vs. Cohabitation – how's that for an incendiary blog title? It's along the lines of Working Mom vs. Stay-At-Home Mom or Star Trek vs. Star Wars. It's a pretty touchy topic, and one that taps into our most intimate life choices. Yet the difference between marriage and cohabitation is one worth thinking about in an objective way. After all, the quality and state of our intimate relationship is perhaps the greatest factor affecting our personal happiness or heartache in life. It's also the greatest factor affecting our children's lives. Considering the magnitude of those things, this decision – Should I choose marriage or cohabitation? – is one that warrants objective consideration. Nonetheless, many people move in together without weighing the long-term pros and cons, without a clear purpose, and without really talking it through. They may be in love, but they haven't discussed whether marriage is an option and, if so, how long they will live together before making it "official." Some people cohabit simply to save money or because they're already spending a lot of time at each other's places. Some do it to test compatibility (although the jury's out on the reliability of that). Some do it for convenience or to have regular no-strings sexual access to a partner. Others, particularly women, may do it out of sheer hope or expectation that it is a quick stepping-stone to marriage. It may be. Or it may be that their boyfriend has no intention of putting a ring on it. Regardless, this is hardly the kind of decision that one should make out of hope or assumption. If you do, you might find yourself waiting – and wasting – years. 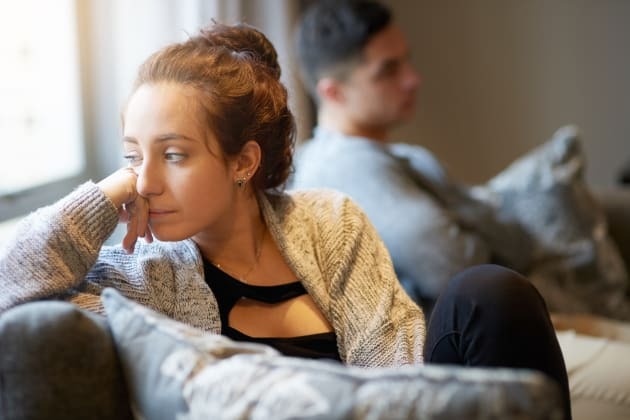 As a couples mediator and marriage author, I must admit that I have seen a difference in the way that married couples and cohabiting couples face conflict. And if you're living together, you might not like it. When it comes to those who seek my services, I would say that over 95 per cebt of them are legally married. That means that unmarried couples are either largely problem-free, which is highly unlikely, or that they are not as motivated as marrieds to invest the time, money or energy it takes to move past problems. When I do work with cohabiting couples, I have found that cohabiting men in particular tend to be far less motivated to work on the relationship than married men are. That's a little tidbit that women should know. But isn't marriage just a piece of paper? After all, those who say that marriage doesn't guarantee happiness are right. Then again, cohabitation isn't a sure thing, either. In fact, research shows that legally married couples stay together at far higher rates than people who are cohabiting. This is particularly important if a couple has kids. Children of married parents are far more likely to live under the same roof as their bio parents to adulthood. This translates into more economic resources and stability, better emotional well-being, more consistent parenting from their father, and less risk of exposure to an unrelated adult (i.e. a parent's new boyfriend or girlfriend or spouse) living in the home. Research also shows that the legal commitment of marriage results in higher levels of happiness and better emotional, mental and physical health for both partners. So not only are married people more likely to stay together and raise their children together, they are also more likely to be happy and healthy in life. But does it really matter which is "more likely" to happen? Are statistics important? Well, to some extent, yes. If the numbers tell us that eating too much red meat is more likely to give us cancer, we may find some practical value in that information. It may or may not change what we order for lunch. For many people, there is a difference between "my husband" or "my wife" and "my boyfriend" or "my girlfriend." One person may say, "Hey, there are no guarantees – you might get hit by a bus tomorrow, so eat up!" while another person may say, "That's true, but I'd like to improve my odds of living longer. I'll have the veggie burger." Both are right – but which is right for you? The point of this blog is simply to encourage young adults in particular to think long and hard about the difference between married life and living together. Because despite the popular idea that "marriage is just a piece of paper," it isn't that simple and it may not be in your best interests to be so dismissive of legal marriage. A marriage certificate isn't "just a piece of paper" any more than a surgeon's university degree is a piece of paper. These documents represent something much larger. For many people, there is a difference between "my husband" or "my wife" and "my boyfriend" or "my girlfriend." That difference is based in the level of commitment that "piece of paper" conveys. Again research has shown that marriage and cohabitation affect people differently. Married people feel a greater sense of commitment from and to their partner, which translates to better coping strategies and well-being, and a greater willingness to work through problems. Similarly, the way other people see you and gauge the commitment level of your relationship will be influenced by that label. Are you husband and wife or boyfriend and girlfriend? You might not care when you're young and child-free; however, you may start to care when kids come along. Of course, I'm speaking in general terms. There are miserable marriages and there are blissful cohabitations, and vice versa. In the end, which wins – marriage or cohabitation – will depend on many things that are simply beyond the scope of a short blog like this: your values, your background, your age and experience, whether you've been married previously, your goals and plans, the kind of lifestyle and family identity you prefer for yourself and your kids, and what makes you feel the most loved, happy and secure in your life. Objective studies and stats are useful, but ultimately they must be considered within the larger context of your life and subjective feelings, opinions and world view. The only "winner" that matters is you. So think about it, be honest with yourself and then make the choice that is right for you now and in the years to come. Don't get married for the wrong reasons and don't settle for cohabitation when you want more. If you make the right decision here – and it's a big decision – you'll spare yourself untold amounts of conflict and regret in life. The more you can focus on consciously deciding what's right for you, instead of simply sliding into a life choice or living arrangement, the better off you and your relationship will be.